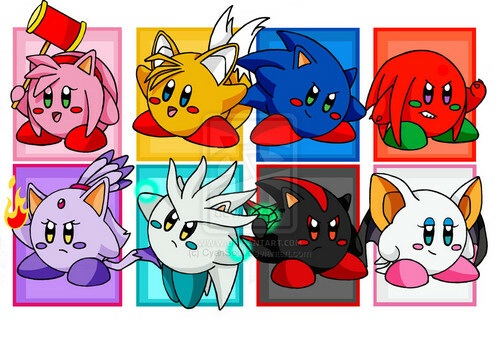 Kirby Sonic team. . HD Wallpaper and background images in the Sonic club tagged: photo. This Sonic photo contains anime, bande dessinée, manga, and dessin animé. There might also be vitrail, fente, un bandit armé, slot, un bandit manchot, machine à sous, and machine de pièce de monnaie. oh mah god!! the epicnes! HAHAHAHA SO DAMN FUNNY I HAHA CAN'T HAHA STOP LAUGHING! *snickers* HAHAHAHAHAHAHAHAHAHAHAHAHAHAHA! They all make cute Kirby's! !